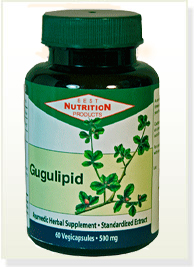 GUGUL - Double blind clinical trials have shown that gugulesterones may be effective in reducing cholesterol levels. Gugulesterones have been a part of the traditional Indian Ayurvedic medicine for approximately 5000 years. Studies also have shown that Lacto-bacillus Sporogenes may be helpful in cholesterol reduction and improvement of intestinal functions.